As usual, I am going to give you an introduction and then link to a specially-selected article. And now for something completely different. For a bit. The article that I am going to link is on a site that is very difficult to read. Edit: It's been improved, so I am leaving this paragraph here for helpful browser hints. So I am going to offer a few practical options. First, many current versions of browsers will let you enlarge and reduce text on pages with CTRL+Plus Sign, or similar keystrokes. You may want to check your "View" in the menu bar. Second, you may want to have an RSS reader available. Several are listed here. Third, Send to Reader is useful for Firefox users with the free "bookmarklet", but works only for Kindle. Fourth, Push to Kindle by fivefilters also has browser extensions. It does what it says, strips out the clutter and sends to the Kindle. In addition, it also has a few other options where you can download the Kindle and EPUB formats. Fifth and easiest, check your browsers or the available extensions such as "Reader View" (built into Firefox) and "Just Read" (extension for Chrome). In my opinion, you'll be glad to have reading options many times over. And now, back to our usual refutation of evolution and irrational worldviews. Proponents of evolutionism have essentially declared war on creationism and Intelligent Design. Some people do not want to allow free speech or contrary viewpoints; they would rather protect their belief system with fundamentalist fanaticism rather than allow scientific discourse. This is not simply a matter of disallowing comments on Websites, since there are many forums that exist for the purposes of argument (such as the Evolution Fairytale Forum). No, some individuals and organizations wish to eliminate the opposition. Not only are there self-appointed storm troopers attempting to preach their false gospel of naturalism at creationist and ID sites, but they have repositories of outdated "science", philosophy and faulty logic. One of the most prominent is the Usenet group Talk.Origins. This group has the support of famous anti-creationists and anti-creation organizations, but is quite overblown. I cannot count the number of times that someone will post something from Talk.Origins as if it was a discussion ending coup de grâce. However, their faith in the group is sadly misplaced. Talk.Origins is a moderated Usenet discussion forum concerning the origins of life, and evolution. It remains a major venue for debate in the creation-evolution controversy, and its official purpose is to draw such debates out of the science newsgroups, such as sci.bio.evolution. In the early 1990s, a number of FAQs on various topics were being periodically posted to the newsgroup. In 1994, Brett J. Vickers established an anonymous FTP site to host the collected FAQs of the newsgroup. In 1995, Vickers started the TalkOrigins Archive web site as another means of hosting the talk.origins FAQs. It maintains an extensive FAQ on topics in evolutionary biology, geology and astronomy, with the aim of representing the views of mainstream science. It has spawned other websites, notably TalkDesign "a response to the intelligent design movement", Evowiki, and the Panda's Thumb weblog. Talkorigins.org has gained many awards and achieved substantial recognition. The Archive is also referenced in college-level textbooks and has had material from the archive incorporated into over 20 college or university courses. Here we can read that the world of science consists of many powerful organizations obviously opposed to anything involving creationism. They are not only opposed to creationism being taught in schools, but against it in general. They give each other good grades in the media, controlled by themselves, which gives the public the notion that they are right and creationism is wrong. It's one big family. ...there is a huge organization behind the evolution propaganda worldwide. 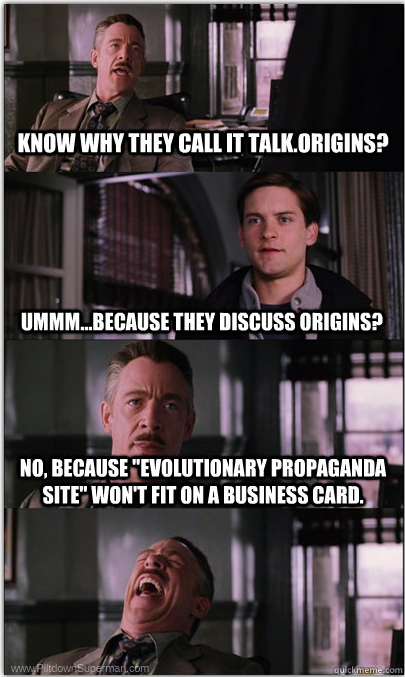 I would like to focus on Talk Origins because that's the website I most frequently viewed in order to find information about evolutionary thought. Because it is backed by mainstream science (and skeptic) organizations it would be wise to not regard it as objective. As everybody now knows it is AGAINST everything that questions evolution, and FOR all that is pro evolution. You can read the the entire article, in context (and remember the tools mentioned at the top of the page), at "Talk Origins vs True Origin". If you click around, that site can keep you busy for quite a while!